As global energy consumption grows at exponential rates, so does the demand for energy solutions that are both more environmentally responsible and more efficient. The DuroMax XP4850EH has a dual fuel system that operates on either standard gasoline or cleaner burning liquid propane which can more than double you generator's run time. With the XP4850EH, operating on propane will not gum up or foul your generator's carburetor, and will give you quick, reliable starts every time. It only takes a few seconds to switch over from regular gas to propane, and with the flexible line, you can easily hook up any size propane tank including the one from your barbeque. And unlike gasoline, propane can be stored for years without going bad. The DuroMax XP4850EH unit features a 7 Horsepower, Air Cooled Engine and is designed with a Low-Oil Shutoff Sensor to protect the Motor. It offers the switching capability of running on Propane or Gasoline fuels. 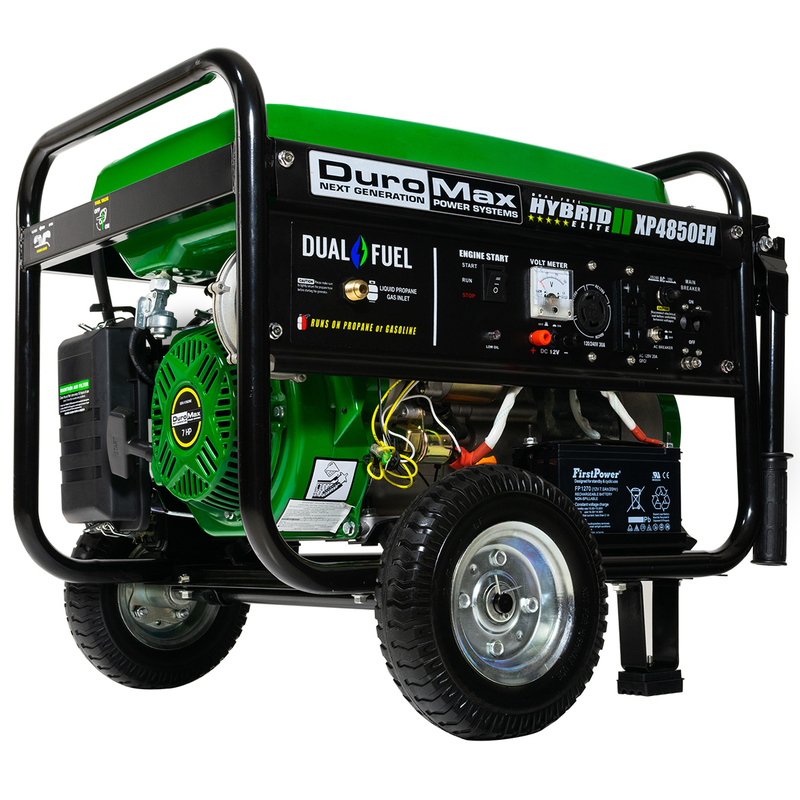 Built to offer more power and longer lasting durability, The DuroMax XP4850EH Generator has a Cast-Ironed Sleeved, 196cc Engine rated at 7 HP delivering a peak of 4,850 surge watts / 3,500 Constant. This is a sufficient amount of power that can handle an overhead Air Conditioner in a RV to basic house power. Designed for Safe and Easy Operation, the XP4850EH features a user-friendly, Electric Start, that's as simple as starting your car. It is also equipped with a recoil start in case of the battery being drained. Solid-Fill tires are also standard, they will never run flat, and high leverage handles that make it easy to transport over every terrain. The attached oversized noise reducing Muffler has a built-in Spark Arrestor for safe use in mandated camping areas and jobsites. DuroMax Generators all carry a 1 Year Factory Warranty so if for any reason your generator gives you problems simply let us know and we will do our best to make it right. As always Factory Authorized Outlet offers its 30 Day Satisfaction Guarantee standard on every item we sell. All DuroMax Generators are user friendly and are ready to use out of the box within minutes. Simply remove all packaging, assemble the wheels and handles, add Oil and Gas and it is ready to begin producing power. Powerful 7 HP Engine is able to accept high wattage loads with ease. This Generator has endless uses; from Home Standby Power, Jobsites to a Weekend with the RV. Simply turn the key and start the Generator. Simply use the E-Z 1-Pull Recoil Cord to start the Generator. Our Friendly Technicians know these units inside and out. Have a Technical Question? Give them a call and they will be glad to help you out. Rest assured, your buying a quality unit at a low price from one of the largest Generator Sellers on eBay. We meet and exceed strict eBay standards while having the feedback that speaks volumes about these units. Allows the user to get maximum power from each of the 120 Volt Receptacle. It also allows the user to choose between operating the Generator at both 120V and 240V simultaneously, or at 120 only with full power. It is recommended that the Voltage Selector switch always be in the 120V position unless 240V is required. Durable DuroMax 7.0 Hp, air cooled with low oil shutoff. Electric Key Start for easy starting when you need it. Clean running propane will not gum up or damage the carburetor. Unlike gasoline, liquid propane can be stored for years. Flexible line allows for connecting to tanks of any size. Designed to run on gasoline or propane for maximum convenience. Idle control holds RPM at a constant level even under heavy loads for fuel savings and noise reduction. DuroMax XP4850EH Electric Start Generator.